Ilze Skujina,Aberystwyth Uni; Danny Clegg, Uni of South Wales (USW), Jennifer Marshall, Cardiff Uni; Eleri Price winner, Aberystwyth; Alexandros Koutsantonis, USW, Tomas Awdry, Aberystwyth, Tracy Perkins, Bangor; Catherine Sharp, Bangor.The ESF funded KESS (Knowledge Economy Skills Scholarship) Project held its Annual Awards Evening at Techniquest in Cardiff Bay on the 12th September, inviting students, academics and companies from across Wales to take part in a research presentation challenge. The event showcased the best of KESS in a challenge whereby each participant outlined their PhD/MRes KESS project in a three minute presentation. 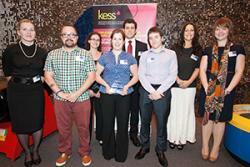 KESS scholars from Aberystwyth University, Bangor University, Cardiff University and the University of South Wales battled it out to win the prestigious KESS award. Following a rigorous voting process, the winner of the 2013 KESS Award was Eleri Price of Aberystwyth University with her presentation on ‘Breeding lamb for better quality’. Eleri’s KESS project is a collaboration between IBERS (Aberystwyth University) and the company partner Innovis. On winning the award Eleri said, “I honestly felt shocked and extremely pleased. I am very honoured to receive this award due to the high standard of the other competitors”. Alex Koutsantonis: ‘CE Marking – Low carbon steel lintel product development’, a University of South Wales project in collaboration with Catnic – A Tata steel Enterprise. Ilze Skujiņa :‘Population genetics of an endangered bird of prey: the Red Kite’, an Aberystwyth University project in collaboration with The Welsh Kite Trust and Ecology Matters. Tracy Perkins: ’The role of estuarine sediments as a reservoir for pathogenic microorganisms’, a Bangor University project in collaboration with Dŵr Cymru Cyf/Welsh Water Ltd.
Jennifer Marshall: ‘Developing online learning resources for Welsh learners at Nant Gwrtheyrn’, a Cardiff University project in collaboration with Nant Gwrtheyrn. Catherine Sharp: ‘Effects of video modelling and rewards intervention on 3 to 4 year old children’s consumption of fruit and vegetables’, a Bangor University project in collaboration with Food Dudes. Danny Clegg: ‘Noninvasive treatment and symptom quantification of Raynaud’s Disease’, a University of South Wales project in collaboration with Tonus Elast. Tomas Awdry: ‘Applying motivational psychology to fitness technology’, an Aberystwyth University project in collaboration with Broadsword. Dr Penny Dowdney, KESS Project Manager at Bangor University said, “The standard of KESS research presented this year has been exceptional, demonstrating the need for industry orientated collaborative research projects at Research Masters and PhD level, driving forward and developing the knowledge economy in Wales in a truly holistic manner”. For more information and examples of KESS projects please see the KESS website.